Cooking is more fun if you do it for someone else. The best cooks like to go out and eat. Parents would love it if you could make dinner. tells you how to plan and make a meal for four in less than half an hour. The parents will be so excited. You can make pancakes. There are two kinds - sweet or savoury. The mixture can be made with a food processor. The frying is a bit tricky - because of the hot oil they need some care, so you might need a little help. To turn them over you want something called a palette knife - this is a long bendy knife that you slide underneath to stop the food sticking. The finished pancakes are hot and crispy. You'll want to eat two or three each. They are even better than chips or french fries. They go well with sausages - or for something different, with apple sauce and sour cream. Now for something sweet. The mixture is quick and easy. All you need is a bowl and a spoon. These are cooked on a griddle - a frying pan is just as good. You might need a bit of help turning these over. They taste very good. This is a picture of some gingerbread houses. It's not easy to do the icing for the doors and windows. It needs a very steady hand. But when they're finished they will last for weeks. Some icing lasts for years. There is a museum in France where they have sugar creations made by a famous chef called Escoffier and they have been there for about 90 years. Brave enough for what? To find out, you need to have the book. It's on page 34. Here's a clue: these are very unusual fish fingers. Anyone who can do this game is special. Send us details of what you did and what it felt like and we'll put it on the website with your name. Email us - we'd like to hear from you. All these have been squeezed out through a piping bag or kit. The big ones at the top are meringues. The faces are crackers with cream cheese. This has also been piped into the sticks of celery and the dates (in the middle). The banana has whipped cream on top. It's fun - and easy when you know how. Imagine being able to turn water blue, or purple. Lookit Cookit tells you how. The blue water is made with just one surprising vegetable. Anyone can do it. You just need a little help cutting the vegetable with a knife. Then watch and you'll see the water first turn blue, then purple. There's a real place in England called Bluewater. It's a large shopping mall. We taste food with our eyes. If something looks good we want to eat it. Look at these two pictures: which one looks more appetising? The first one is a photo of some red peppers. They are vegetables - bright and colourful. They make you think of crunchy sweetness. These are cupcakes, which most people would expect to be more appealing. But because of the pale icing they don't look so good. Pale food is not always appetising. If you want a bright thought with a picture every day, follow my blog. You might get an idea for something creative, a photo that makes you smile, a quote that makes you laugh. Welcome to the armchair kitchen. For 2 people you will need 500g/1lb boneless lamb shoulder, 2 onions, peeled and cut into quarters, 4 potatoes peeled, 3-4 tbsp olive oil. For the stuffing: 75g/3oz breadcrumbs (fresh not crisp), 2 tbsps olive oil, 1 onion, handful of fresh parsley, 3 tbsp chicken stock. First make the stuffing: if you have some stale bread, remove the crusts and buzz it up in a liquidizer or food processor till you have crumbs. If you have too much for this recipe, the rest can be frozen in a plastic bag). Chop the onion finely and fry it in a little olive oil. Add the breadcrumbs and toss in the almost dry pan for a few minutes till they start to brown a little. Stir in the chopped parsley and the chicken stock. Leave to cool and then spread the stuffing over one piece of lamb. Preheat the oven to 185C/380F. Cover with the other lamb fillet and brush the top with either the honey mustard or balsamic glaze. Tie the two together with string. Put a little more oil in a baking tin and when it is hot add the onions. Cut the potatoes into small pieces and turn the vegetables around in the oil. Put the stuffed lamb in the centre of the tin and cook for 40 minutes. Turn over the onions and potatoes so they brown each side. Continue cooking for another 30 minutes, remove the meat, potatoes and onions to a serving dish and pour about a cupful of hot water or chicken stock into the pan. Stir in the brown bits from the pan and pour this gravy into a small jug. Slice the meat into thick pieces and serve each portion with some of the stuffing, some roast potatoes, onions and if liked, a few frozen peas. You will need: 2.25kg/5lb duck, 450g/1 lb small onions, 4 large potatoes, 2-3 tbsp oil. Prick the duck all over with a skewer (the fat lies in a layer under the skin and pours out through these holes.) Peel the vegetables and cut the potatoes into small pieces. Spoon the oil into an ovenproof dish and put the potatoes in one side and the onions in the other. Shake it slightly and turn the vegetables over so that they are lightly coated. Put the dish on a lower shelf in the oven. Put the duck on a rack, in the baking tin, and cook on a high shelf for about half an hour. Open the door, lift out the duck and pour any fat out into a bowl. Turn the oven down to 325F/160C and replace the duck. Leave it to cook slowly for another hour, occasionally turning it over and pouring off any more fat which has accumulated at the bottom of the tin. Turn the potatoes and onions too, to make sure they are browning evenly. Then turn the heat back to high as before and continue roasting for the final half hour until the duck skin is crisp. Put the duck on a serving dish and leave to stand for about ten minutes. Pour some boiling water (or a glass of wine) into the pan and mix it well with the dark crispy bits and juices. When it bubbles it will be a dark gravy. Cut the duck into quarters and surround with the roasted potatoes and onions. Serve with apple sauce or redcurrant jelly. The duck fat will harden as it cools - it is brilliant for cooking roast potatoes on another occasion. For 4 people you need: 16 veal spare ribs, 2 tbsp grated fresh ginger, 4 tbsp soy sauce, 2 tbsp golden syrup or honey, 12 tbsp tomato passata, 8 slivers dried chilli, 2 cloves garlic, 2 tsp paprika. Cover the spare ribs with water and bring to the boil. Cook over medium heat for about 30 minutes. Drain (and keep the liquid, with added flavouring, to make a soup for another time). Meanwhile mix all the other ingredients. Put the ribs in a large bowl, toss them in the marinade and leave for a couple of hours or overnight. For the cooking: preheat the oven to 180C, 360F. Line a baking tin with baking parchment and lay out the ribs in a single layer. Cook, covered with foil, for 35 minutes, then remove the foil and continue cooking under high heat for about 15 minutes till they are glazed and shiny. For one person, you will need: 2 tablespoons olive oil, 4 mushrooms, 100g/4oz pappardelle pasta (dried), 2 tbsp Marsala, or any white wine or sherry, 2 tbsps frozen peas. (If you are a child your parents would probably prefer you not to add the wine, so it's optional). 80ml single cream, salt and black pepper for seasoning. First put a large pan of water on to boil. Put in the curled up pasta and add salt. Boil it over medium heat for about 10 minutes, but be careful because the water will bubble up and might spill over the top of the pan. While it's cooking you can make the sauce. Wipe the mushrooms with a damp paper towel and slice them up. Put the oil in a small frying pan and when it is hot (about a minute) toss in the sliced mushrooms. Stir them round with a long spoon or wooden spatula, so they are coated with the oil. Add a little salt and black pepper. Leave to cook for about 5 minutes till they are light brown on both sides. Add the splash of Marsala or wine, if you are using it. Then pour in the cream and the frozen peas and stir till it is bubbling hot. Drain the pasta, pour over the mushroom cream sauce and sprinkle over some freshly grated parmesan cheese. You will need a 1lb loaf tin, lined with baking paper. This is to stop the cake sticking and to make it easy to lift out. Put the butter, sugar, eggs, lemon rind, flour and butter in a bowl and beat well until the mixture is quite smooth. It's a good idea to use an electric mixer if you have one. Spoon the mixture into the tin and bake for about 35-40 mins. To see if the centre is cooked, gently press a strand of spaghetti into the centre. If it comes out dry it is done. Cool the cake in the tin while you make the syrup. In a small pan heat the icing sugar and the lemon juice until the sugar has melted. Boil it gently for a few minutes. Prick the cake all over with a fine skewer (or another strand of spaghetti if you don't have one) and then pour over the syrup. Leave the cake in the tin until it is cold. Lift it out, peel off the paper and keep it covered with clingfilm or foil until you are ready to serve it. The loaf will keep for several days, wrapped in foil and should be served in thick slices. If you want to serve just one slice, it's a good idea to give it 20 seconds in a microwave to make it moist again. To make the cake you need a cake tin with a diameter of 8 inches/20cms. If you don't have one this size don't worry. You can use a square or rectangular tin and if it is much bigger, just double the quantities in the recipe. The ingredients: 2 large eggs (separated), 4oz/100g sugar, 4oz/100g self raising flour, 75ml oil, 8oz/225g berries, 1oz/25g ground almond + extra 1oz/25g sugar. Preheat the oven to 190C/400F and line the cake tin with baking parchment or oil it well. First whisk the egg whites till they are stiff. Put them on a plate. Then whisk together the egg yolks and the sugar till they look thick and creamy. Fold in the whisked egg whites, then add the flour and the oil, mixing slowly till everything comes together in a batter. Pour this into the prepared cake tin and cover the cake mixture with the berries. Mix together the ground almond and remaining sugar and sprinkle this over the top. Bake for about 30 minutes. A cocktail stick or strand of spaghetti poked into the middle should come out dry. If it doesn't, continue cooking for another 5 minutes or so. Leave to cool and serve with extra berries and if you like, cream or creme fraiche. You will need an oval dish about 28cm/11in long. Preheat the oven to 200C fan/400F. Peel the celeriac and cut it first into chunks, then into slices. Immediately drop them into cold water with the lemon juice (this stops them going brown). Drain the slices, then put them in a shallow microwave dish and cook on full power with a few tablespoons of the vegetable stock for about 5 minutes. Rub the butter round the dish and pile in the celeriac slices. Add the frozen peas and pour over the vegetable stock. Mix the breadcrumbs with the cheese and sprinkle evenly over the top. Bake the gratin in the oven for about 25-30 minutes when the celeriac and peas will be cooked and the top with be crunchy and brown. Here are some leeks, and in the front, English asparagus. It can be cooked very quickly in the microwave: put up to 20 spears on a long dish, sprinkle over about 3 tablespoons of salted water, cover and cook on full power for about 6 minutes. The ends will be tender and the tips just cooked. You need 100g/4oz salted butter, 2 large egg yolks, 1 tablespoon lemon juice, 1 tablespoon wine vinegar, a little pepper and 2 teaspoons of boiling water. Put the butter in a jug and cook on full power for about 1 minute to melt it. In a bowl, or a glass or china sauceboat with a capacity of 175ml/6 fl oz, mix the egg yolks with the lemon juice and vinegar. Pour on the melted butter whisking well. Put this in the microwave on low power for about 50 seconds, but take it out once or twice during this time to whisk it again. It should be just thick but it will continue to cook and thicken a little more after it is left to stand for a few minutes. Season with pepper and stir in the boiling water. Serve it immediately with hot vegetables. A bit of advice: if the sauce curdles (i.e. the egg seems to 'separate') stir in an ice cube and whisk it hard. It should come back to the right consistency. If this doesn't work, start again by just melting some butter and pour this over the asparagus! Cut the leeks into slices and wash them, in a colander, very well until there are no dirty bits (specially found in the darker leaves). Peel and cut the potatoes into big cubes. Put the vegetables into a saucepan and cover with water. Add some pepper and about 1 tablespoon of stock powder (I use Osem Parev Chicken stock, which is vegetarian but made to taste like chicken). Bring to the boil and simmer for about 10 minutes until the leeks and potatoes are soft. Pour the soup into a blender and liquidize until the mixture is very smooth. Taste for seasoning: you may need to add salt but the stock powder is salty so I rarely do. Leave to cool. If the soup is very thick stir in some milk. Pour it into bowls and swirl over some single cream. Of course if the weather is cold, you can serve the soup hot. 175g/6oz self raising flour, 1 tsp baking powder, 50g/2oz sugar, 50g/20z softened butter, 1 egg, the grated zest of 1 lemon, 150ml/5fl oz milk. Preheat the oven to 185C/360F. Butter the baking dish or cake tin. Put all the ingredients above into a large bowl and beat (preferably with an electric mixer) untill the mixture is smooth and there are no lumps. Spread this into the tin. Peel and slice 450g/1lb (about 4) large apples. Arrange them over the cake mixture. Take 50g/2oz butter and melt it gently (this is best done in a microwave for about 30 seconds). Then brush this all over the apples. Sprinkle with 175g/6oz demarara sugar and put the cake in the oven. Bake for about 35 minutes or until the top has caramelized to a deep golden brown. Serve warm with a little creme fraiche, plain yogurt or cream. For this you need a liquidizer or a stick blender as the soup has to be smooth and creamy. You need: 2 large courgettes weighing about 750g or 1 1/2 lbs, 500ml/18 fl oz vegetable stock, 1 onion, chopped, 2 sticks celery chopped, 3-4 tbsp olive oil, 25g/1oz ground almond, 200ml/7 fl oz milk or single cream. Salt and black pepper. To serve: few tbsp toasted flaked almonds. With a vegetable peeler make some thin strips for decoration. Set these aside. Slice the courgettes into rounds. Put them in a microwave dish with 3 tbsp vegetable stock and cook on full power for about 5 minutes. Curl the reserved strips and microwave these for about 40 seconds. You can fry the courgette slices (as in the picture above) instead of microwaving them, but they will begin to colour and brown so I prefer to fry only the onion and celery. It's a good idea to marinade the salmon in the flavouring for at least half an hour before cooking. You can even do it hours in advance and keep the fish in the fridge till you are ready. You need: 2 thick salmon fillets (preferably with the skin on), 1 tsp honey, 1 tsp fresh ginger, grated, 1 clove garlic, finely chopped or grated, 1 orange and 1 lemon (using only the zest of the skin), 1/2 tsp or few slivers dried chilli, 1 tbsp soy sauce. To serve: mashed or baked potatoes, peas or sugar peas. Cut the zest off the orange and lemon and reserve half of it for decoration. Put the salmon fillets in a shallow dish. Mix the honey, ginger, garlic and zest of the lemon and orange and spoon them over the fish. Cover with clingfilm and refrigerate till you are ready to eat. Have ready some cooked potatoes or rice and perhaps some peas or sugar peas. (The fish takes only minutes to cook so it's a good idea to have the side dishes already prepared). Lift off the clingfilm and spoon the soy sauce around the salmon, on to the bottom of the dish. Cover again with clingfilm or a plate. Cook on full power in the microwave for 2 minutes. Leave to stand for 1 minute and then serve. A note here: if the salmon is less than an inch thick, it will take even less time - say a minute and a half cooking. Arrange the potatoes on two plates with the sugar peas on the side. Carefully lift off the clingfilm (steam will escape) and put the fish on the plates.. Garnish with the reserved orange zest. You will need a loaf tin (1lb/450g capacity) baking paper and a large bowl for mixing. Then: 8oz/230g stoned dried dates, 1/2 tsp bicarbonate of soda, 5 fl oz/150ml boiling water, 1 egg, 1/2 oz/15 g butter, 5 oz/150g self raising flour. More butter to serve. Cut the dried dates into small pieces and put them in a bowl with the boiling water and soda. It will fizz slightly. Leave the dates to soak for about 5 mins. Line the tin with the baking paper. Then add the egg, butter and flour to the softened dates and beat well till the mixture is smooth. Make sure there are no lumps of flour, but it doesn't matter if there are a few small pieces of date. Pour the mixture into the tin and bake for about 1 hour. To see if it's done, insert a cocktail stick (or a strand of spaghetti) into the loaf and if it comes out dry it is cooked. Leave it to cool a little then lift the bread out of the tin. When it's cold take off the paper. To store it, wrap it in foil or clingfilm, but it won't last long because it is so delicious sliced and spread with butter. For 4 people you need 300ml/1/2pt vegetable stock, 2 medium sized potatoes, peeled, 600g/1 1/4 lbs fresh cod or haddock, 4oz/125g frozen peas, 300ml/1/2 pt milk, black pepper, a little salt. To garnish: parsley, finely chopped spring onion. Bring the vegetable stock to the boil. Cut the peeled potatoes into small chunks and cook them in the stock for about ten minutes until they are tender. Lift them out of the pan with a slotted spoon. Add the frozen peas and the fish, cut into small pieces, and cook over medium heat for about 5 minutes. Stir in the milk and the potatoes and bring the soup gently to the boil again. Taste for seasoning (it may or may not need salt, depending on the strength of the stock). . Serve the soup hot (or reheated if you make it in advance) with crusty bread or rolls. For a variation you can use smoked fish. (Pale undyed smoked haddock or cod is better than the bright yellow pieces). As smoked fish is saltier than fresh, you may need no salt at all. You need: 4 medium/large potatoes, 1 onion, 2 small eggs, 2 tbsp matzo meal (from a Jewish deli), salt, pepper and oil for frying. Start by grating the peeled potatoes and onion. Use either a hand grater or the grating disc of a food processor. Squeeze the grated vegetables in your hands till all the chalky white liquid comes out. Throw it away. Beat the eggs and stir them into the potatoes and add the matzo meal. Then add a few grinds of black pepper and plenty of salt – more than a pinch and less than a teaspoon. Taste the mixture even though it's raw: too little salt will make it bland. Add the salt gradually, tasting as you go. Pour ½ inch of oil into a frying pan and heat it for about a minute. Place spoonfuls of the mixture all over the pan, not too close together. The oil should sizzle as soon as the first pancake goes in. Flatten them with a long spoon so they are about ½ inch thick and fry until the underside is crisp and brown. Turn them over with a bendy palette knife and brown the other sides. Drain on paper towels and serve immediately. For 3 people you need 12 chicken wings (3-4 each). Then, 2 teaspoons each of oil, soy sauce, dark brown sugar and lemon juice, plus 4 teaspoons of tomato puree (paste) and 1 teaspoon paprika. Mix the oil, soy sauce, sugar and lemon juice in a bowl. Stir in the tomato puree and paprika. Cut some slits in the chicken wings and paint the mixture all over and into the slits. Cover a baking sheet with baking paper and heat the oven to 200C, 400F. Roast the wings in the oven for 20 minutes, then turn them over and cook for another 10-15 minutes. Scoop up the bits of sticky sauce and serve with the wings. For the rice simply boil a cupful of washed rice in a large pan of salted water. After 6 minutes test to see if the rice is tender, drain and serve with the chicken wings. You will need: 4 onions (peeled and chopped), 3-4 tbsp olive oil, 4 large eggs, 5 heaped tbsp mascarpone cheese, salt, pepper. Heat the olive oil in a large frying pan and saute the chopped onions over medium heat for about 15 minutes. They should cook slowly without browning too much. (The taste of onions improves as they cook, bringing out the sweetness). In a large bowl whisk the eggs and add some salt and pepper. Then whisk in the mascarpone cheese until you have a smooth mixture. Fold in the fried onions. Line a shallow round bowl with baking parchment and pour in the mixture (lining the bowl makes it easier to turn out so it won't stick to the base). Bake in a moderate oven 175C/350F for about 20-25 minutes. When it's cooked it looks like this. Slide it out on to a plate, leave it to cool slightly and then put another plate on top and turn it over. Then you can peel off the paper. Serve warm or cold, cut into wedges. lettuce (or watercress or rocket), tinned borlotti beans, plum tomatoes, cucumber, spring onions and grapes. Poach the skinned chicken breasts in 500ml chicken stock for about 10 minutes or until they are tender or no longer pink in the middle. Leave to cool then remove from the stock and cut into large dice. When the chicken is quite cold mix with the mayonnaise and chopped spring onion and arrange in the centre of the salad. Variation: use tinned or fresh cooked tuna and mix with spring onion and mayonnaise as above, or simply use a ball of buffalo mozzarella for each serving, drizzled with good olive oil. Cooked gooseberries go well with fresh mackerel. For two people you need: two mackerel, split open, bone in; 1 punnet fresh gooseberries, 2-3 tbsp sugar. Put the berries in a glass dish, sprinkle over the sugar and microwave, covered, on full power for 2-3 minutes, when they will be soft. Then press them through a sieve till you have a thick puree. Taste for sweetness and stir in a little more sugar if you want. Wipe the fish clean and set them on a grill pan, skin side down. Grill under high heat for about 10 mins. The bones will be a bit charred but the flesh should be moist and white. Don't cook for too long as overcooking dries up the fish. Serve on warmed plates with the gooseberry sauce on the side. You will need: a large frying pan, 2-3 tablespoons of olive oil, 1 onion, chopped, 2 cups bulghur, 4 cups boiling water with a vegetable or chicken stock cube. Heat the oil in the frying pan and put in the chopped onion. Saute over medium heat until it turns golden and season with a little salt and pepper. Then add the bulghur. Stir it around and add twice the amount of boiling stock. (With cup measures this is easy: 1 cup bulghur: 2 cups liquid, 2 cups bulghur: 4 cups liquid, etc.) Bring to the boil and cover with a lid or a sheet of foil and turn off the heat. Ten minutes later you will have perfect, cooked, fluffy bulghur. In the picture this is served with roasted vegetables: peppers and red onion cooked in a hot oven (190C/380F) for 30 minutes. The peppers will have blackened skins, but these come off easily and can be removed with a knife once they have cooled a little. Arrange the vegetables on the bulghur and if you have allowed it to go cold, reheat, covered in a microwave for a few minutes. A quick dessert in half an hour. For four people you need: four ripe peaches or nectarines, a packet of short crust pastry, sugar, the white of one egg. It’s also useful to have a palette knife to slide under the pastry. Sprinkle a little flour on the work surface and roll out the pastry. To make this easier you can cover the pastry with clingfilm so it won’t stick to the rolling pin. When it is the thickness of a pound coin (about 1/3 cm) cut it into squares measuring 3.5 inches (9 cm). Cut the peaches in half and remove the stones. Put half a peach on each square and then pull up each corner to make a parcel, folding the corners over and pinching them together in the middle. Whisk the egg white lightly with a fork (otherwise it is too gloopy) and brush a little on to each parcel. Sprinkle with sugar. Arrange the parcels on a baking sheet covered with baking paper, and cook in a hot oven 190C, 380F for about 20 minutes, till they are golden. You can serve the pastries hot or cold, but warm is best. For 2 people you will need: 350g/12 oz chicken livers, a bag mixed leaf salad, a romano red pepper (or ordinary one if you can’t get this long thin variety), 2 red or white onions, a handful of sugar peas and french beans, pecan nuts or pistachios, a few sun dried tomatoes. Dressing: olive oil, balsamic vinegar, salt and pepper. First heat the oven to 190C/380F. Peel and slice the onions and arrange them on a baking sheet covered with baking parchment. Slice the onions and roast them for about half an hour, turning once to brown both sides. For the dressing mix 3 tablespoons olive oil with 1 tablespoon of balsamic vinegar. Season with salt and papper and stir well. Put the washed salad on to plates, add the sliced peppers. In lightly salted water, boil the french beans for 6 minutes and the sugar peas for 3, then drain and arrange them on the plate, with the roasted onion. Cover the grill pan with a fresh sheet of lightly oiled baking paper and grill the chicken livers under high heat for about 6 - 8 minutes, turning them once, but making sure they are still pink inside. (Alternatively you can fry both the onions and the livers in a pan, using a little olive oil and cooking the onions first till they are golden, and then adding the livers for about 5 minutes of cooking time.) Season with salt and pepper, pile the cooked livers in the centre of the dish and sprinkle over some pecans or pistachios and a few sun dried tomatoes. Sprinkle over a little of the dressing and serve immediately. Choose a weekend or holiday when you are home for some while as the sauce needs long, slow cooking. But once you’ve assembled it all, you can relax and let it simmer. The amount I suggest is enough for 4, but you could double the ingredients and make a big pile, which will give you some to freeze for another time. You’ll need things you have in your cupboard: olive oil, a beef stock cube, sugar, salt and pepper, and some tomato puree or a carton of creamed or plum tomatoes. For the meat you need 500g/1 lb minced beef (you don’t have to choose the best quality and you’ll see why later). Then 2 peeled onions, 2 sticks of celery and 2 carrots, 2 cloves of garlic, all chopped very fine, and if you have it, some left over red wine. Start by cooking the meat in a non-stick pan. Over medium heat cook the mince with no oil until it begins to brown. Keep stirring it to break up any lumps and carry on till it no longer looks pink. This will take 10-15 minutes. Transfer the meat to a deep saucepan. Wipe out the frying pan and put in a few tablespoons of oil. Cook the chopped onions first over medium heat, stirring so they don’t get too brown. Then add the carrot, celery and garlic and continue frying till all the vegetables are beginning to soften. Sprinkle over the beef stock cube and either a carton of creamed or plum tomatoes. Mix it all well, season with pepper, a half teaspoon of sugar and over high heat add about a cup of wine, if you have it. If not, just add water and bring it all to the boil. Pour this over the meat in the saucepan, making sure it is well covered and cook over low heat for at least an hour, and preferably 2-4 hours. Just make sure you keep an eye on it, so it doesn’t burn - topping it up with more water if necessary. Taste the sauce and add salt if it needs it, then when the meat is all completely soft pour the liquid into a pot and leave it to cool in the fridge. A thick layer of fat will come to the top (which is why you don’t have to buy the most lean and expensive meat) and when it is solid you can take it off and throw it away. Underneath will be a rich beef jelly. Spoon this back into the meat and reheat the sauce in the microwave when you are ready to serve the pasta. Now for the last stage: Cook the pasta (tagliatelle or lasagne) according to the packet instructions and then drain it well. Fold it into the hot meat sauce and serve. You need: 4 med potatoes (about 2 lbs), 1 bunch spring onions (scallions),2 tbsps olive oil, a handful of frozen peas, a vegetable stock cube, 300 ml milk. A few sprigs fresh parsley. If you have a potato baller, cut the peeled potatoes into balls and drop them into cold water. This stops them going brown. Then put them in a pan, cover with salted water and boil for about 10 minutes. (Cook the extra pieces in a separate pan and use them later for mashed potato).Add the frozen peas and continue cooking for another five mins till the potatoes are cooked - test with a fork to see they are done. Chop the spring onions into small pieces and saute in the olive oil for a minute. Put the stock cube into a small bowl and add some of the potato cooking liquid till it is melted. Then combine everything together in the large pan: the potatoes and peas, the spring onions, the stock and the rest of the cooking liquid. This will make a fairly clear soup. To make the thicker version, add the milk and a few sprigs of parsley and buzz it all up in a liquidizer. Taste for seasoning and serve. Variation: you can add other vegetables: my picture shows a bit of jerusalem artichoke. But carrots are good too. 3 whole eggs, 2 egg yolks, 1/2 cup sugar, 1/2 litre whole milk. 1/2 cup cream, 1/2 tsp vanilla essence, 6 1/2-in thick slices brioche, crusts removed and buttered on one side, handful of raisins or sultanas. Butter a shallow two-quart baking dish. Gently beat the eggs, egg yolks and sugar till thoroughly blended. Scald the milk and cream in a pan over high heat. Don’t boil. When you tip the pan and it makes a sizzling noise, remove from the heat and stir in the vanilla extract. STIR GENTLY, don’t beat, into the egg mixture until blended. Serve warm (not cold, or hot) with some extra cream. (This recipe comes from the writer Nora Ephron, from her book I Remember Nothing. I've changed it slightly: included raisins or sultanas and missed out adding more sugar on top and glazing it under a grill). If you’re under 12 you need to get an adult to help you with the cutting and boiling. You might also do better to try the microwave method (see below). Cut the kumquats in quarters and take out any pips you can see. Put in a small saucepan with the sugar and about 3-4 tablespoons of water. Bring to the boil and then simmer for about 5-10 mins until the kumquats are soft and the liquid has reduced to a syrup. If you are in a hurry you can microwave the kumquats. Put them in a shallow dish with the sugar and 2 tablespoons of water. Cover and cook for about 4 minutes. They won’t be quite so soft and syrupy but they are still good. Kumquat preserve is a great accompaniment to rich meats like duck or lamb. It goes specially well with cold turkey. You’ll need: 2 aubergines (about 8oz/225g each), 2-3 garlic cloves, 3 tbsp tomato puree, 8 tbsp olive oil, sugar, salt and pepper. Carefully cut the aubergines into slices with a sharp knife. Cover a tray with baking paper and sprinkle on half the olive oil. Dip each slice of aubergine in the oil and then turn it over. Arrange the slices in a single layer on the tray. Crush the garlic and then stir it into the tomato puree with some salt, pepper and 1/2 tsp sugar. Add the rest of the oil. Paint most of this paste on to the aubergine (reserving a little for later). Bake in a hot oven (200C/400F) for about 20 minutes. Turn over the slices, paint with the rest of the tomato mixture and cook again for a further ten minutes. Leave to cool and add a little more oil if you wish. All you need is some red peppers, red onion and sweet potato. The quantities don’t really matter. It depends how hungry you are and what else you have to eat with this, but as a guide, for two people you’ll need 2 peppers, 1 onion and 1 sweet potato. Cut the peppers in half and remove the seeds and white bits inside. Peel and slice the onion. Peel the potato and cut it into cubes. Heat the oven to 190C/380F (preferably using top heat which browns food better). Spread a sheet of baking paper over an ovenproof dish or tin. Pour in a few tablespoons of olive oil and arrange the vegetables in a single layer, turning them over to coat with the oil. Season with salt and pepper. Roast for about half an hour. Lift the peppers on to a serving dish and fill with the sweet potato cubes. Scatter over some of the roasted red onion. First make a chocolate sponge cake. For this you need an electric mixer. Then: 4 large eggs, 100g/4 oz sugar, 75g/3 oz self raising flour, 4 tbsp cocoa powder. For the filling: use either custard or whipped cream. For the topping: 100g/ 4oz (1/2 large bar) plain dark chocolate, 1 tbsp golden syrup, 1 tsp oil. Turn the oven to 190C/380F. Heat the bowl and whisk of the mixer with some hot water while you assemble the ingredients. Then pour away the water and dry the bowl very well. Whisk the eggs until they start to get foamy. Pour in the sugar and keep whisking until they are pale and thick. This will take at least five minutes (or much longer if you are doing it by hand). Then put the flour and cocoa through a sieve and gradually fold this sifted mixture into the eggs and sugar. Keep lifting and folding till there are no lumps or bits of dry flour. Don’t spend too long on this or you will lose the air that has been whisked into the eggs to make them light. Pour the mixture into a tin lined with baking paper. (I used one 32 x 23cm or 12.5” x 9”). If you use a larger one the cake will cook quicker as it will be more shallow. Bake for about 15 minutes. Put a cocktail stick or a strand of spaghetti in the middle and if it comes out dry the cake is cooked. When it has cooled, cut the cake into squares. If it is shallow spread the cream on one square and put another on top. If it is deeper, cut it in half across and put the cream inside. Put the topping ingredients into a jug. Cook on full power in the microwave for a couple of minutes until the chocolate is melted. Stir well and then add a few tablespoons of boiling water if it seems too thick. Mix very well and pour the hot chocolate sauce over the cool cake. (You can make this sauce in advance and reheat it, just before serving). You need: a large glass bowl, a fork and a spoon. 1 egg, 2 dsp vanilla sugar *, 7 fl oz/200ml milk, 12oz/ 350g cooked flat pasta or vermicelli, 2 dsp raisins. First a couple of notes: the weight of cooked pasta is about 4 or 5 uncooked rolled ‘nests’ of tagliatelle. Vanilla sugar is made by splitting a vanilla pod and leaving it in a jar of ordinary sugar. The sugar will have a delicious taste and can be used for any baking. Put the egg and the sugar in the bowl and whisk with a fork. Add the milk and then mix in the cooked pasta and raisins. Set the microwave to medium power and cook the noodles for about 5 minutes - stopping two or three times to stir. This is important - the egg and milk will make a custard and if it cooks for too long it will curdle or get hard. The noodle pudding is cooked when the milk is no longer thin and the custard coats the strands of pasta. You can add a little more milk if it looks too thick. It tastes good warm or cold. This recipe comes from Bill Grainger in the Waitrose magazine. It’s light and fresh, yet very filling. 300g/10oz rump or rib steak, 2 cloves garlic, 2.5cm/1in piece of peeled ginger root, 1/2 tsp toasted sesame oil, 1 red chilli, 1 litre/ 4 cups beef stock, 2 tbsp soy sauce, 125g/5oz medium egg noodles, 4-5 leaves savoy cabbage, 4 salad onions. Grate the ginger and the garlic and rub half this mixture with the oil, into both sides of the steak. Leave it on a plate, covered, for at least 10 minutes (or in the fridg for hours if you like). Put the rest of the ginger and garlic in a pan with the beef stock. Cut the chilli open and remove the seeds. Slice it very thinly. Roll up the cabbage leaves and slice them thinly too. Cut the spring onions into thin diagonal slices. Now you are ready to start the cooking. Bring the beef stock to the boil, then add the chilli and soy sauce. Turn down the heat to a gentle simmer. Add the noodles and the cabbage. Cover with a lid and leave for about 4 minutes. Meanwhile heat a griddle pan. Wipe the marinade off the steak and grill it for about 2 minutes each side. (If you have a grill that closes with a lid, the meat doesn’t need to be turned. Since it cooks the top and bottom it will need only 2-3 minutes in total.) If you use the Thermapen you can choose the temperature so the meat will be rare, medium or well done. Lift the noodles and cabbage into bowls and pour over the broth. Slice the steak and lay it on top. Finish with the spring onions and another tablespoon of soy sauce. Who doesn’t enjoy pressing, rolling, cutting out? There’s nothing that can go wrong - but do follow the How-to carefully because quantities and timings are important with cakes and biscuits (unlike with soups or casseroles where you can add more or less of what you like). You need: a baking sheet, non-stick baking paper, a rolling pin, a palette knife and possibly a wire tray. Preheat the oven to 180C/350F and cover a baking sheet with non-stick baking paper. Rub the butter into the flour with your fingers, or in a mixing machine. It should look like breadcrumbs, with no big lumps. Put aside a few tbsp sugar and mix the rest with the cinnamon and flour. Add the cold water to the egg yolk and stir this into the flour, mixing till you have a firm dough. (If it is too soft put it in the fridge for about half an hour). Sprinkle a little flour on the worktop and then roll out the dough. It’s a good idea to cover it with clingfilm first so that the rolling pin won’t stick. Sprinkle over the flaked almonds, cover again with the film and roll it out again till it is about 5mm/1/4in thick. Cut out rounds with either a special cutter or a small glass, and with a palette knife slide the biscuits off on to the baking tray. You can reform the dough and cut more rounds to use it all up. Whisk the white of egg lightly, brush it over the biscuits and sprinkle over the remaining sugar, and a few more almonds if you like. Bake in the centre of the oven for about 10-15 minutes or until they are golden brown. They will seem quite soft when they come out of the oven, but harden as they cool. Lift them off the paper carefully and if you have a wire rack leave them there to cool. Store them in an airtight tin - or if you want to keep them for more than a few days, freeze them. They take almost no time to defrost and can be eaten minutes after you take them out of the freezer - in the time it takes to make a cup of tea. This is made in two stages: first the filling and then the mashed potato topping. It’s not difficult, but it takes several hours and you need to be patient. (The vegetarian version - see below - is much quicker). In a frying pan heat the olive oil and fry the onion over medium heat till it starts to brown. Then move it to a plate. Put the minced beef in the pan and fry it over a fairly high heat, turning it all the time to brown it all over. (If you are using a non-stick pan you won’t need any more oil, as the meat has enough fat which will be released as it cooks). Leave it cooking for at least 10 minutes, stirring frequently so it doesn’t stick to the pan. You want it to be broken up and the longer you cook it at this stage the tastier it will be. Then make up the beef stock and pour it over, with the tomato puree and seasonings. Continue cooking the meat mixture for at least two hours, over low heat. Cook the potatoes in salted water for about 8 minutes or until they are just tender (don’t overcook or they will be soggy.) Drain them well and then mash till there are no lumps. Add the olive oil gradually (you may not need quite all of it) and taste for seasoning. Put the cooked meat mixture in the bottom of a greased dish. Then spoon over the mashed potato and mark it with a fork. Or if you have a piping bag you can pipe the potato over the top which looks pretty. Heat the pie in a hot oven (about 190C/375F) until the top begins to brown - this will take about 10 minutes. But you can prepare the whole thing in advance and heat it later, in which case it will take longer to heat the centre and will take about 30 minutes. If you are making the little ones and want to eat them in your fingers, use a muffin tin and put a small round of toast in the bottom of each indentation before you spoon a little of the meat mixture into each one. Then top with the mashed potato as above. You can do without the meat altogether. Instead of minced beef use 500g/1lb mushrooms and fry them in oil with the onion. Instead of beef stock, add a few tablespoons of soy sauce and use this filling before you add the mashed potato topping. It’s not hard to make this velvety soup, but you need some help: if you’re a child, have an adult around to help with chopping and frying. If you are an adult, the help you need is a frying pan and a blender, and perhaps a swig from a bottle of sherry. Get together olive oil, 450g/1lb mushrooms, 25g/1oz butter, 25/1oz plain flour, 150ml/5 fl oz vegetable stock and 350ml/12 fl oz milk. First wipe the mushrooms and chop them into small pieces. Heat about 2 tbsp oil in a large frying pan and then fry the mushrooms till they begin to brown. Add some salt and pepper. Tip them out on to a plate. Put the butter into the pan, stir in the flour till it makes a paste (only a minute) and then pour in the stock. Keep stirring until the mixture begins to get thick, then add the milk and the mushrooms. Cook over low heat for about 5 minutes. If you have a stick blender you can do the next step in the pan (otherwise pour it into the bowl of a liquidizer). Blend the mushroom mixture till it’s smooth. If it seems too thick, add more milk or some cream. Taste for seasoning and add more salt or pepper if it needs it. Reheat the soup over a low heat (or in the microwave). Pour the hot soup into bowls and for an extra touch, add another swirl of cream and a spoonful of sherry. To make mushroom sauce, simply reduce the amount of stock and milk and leave it thick. It tastes good with fish or even piled on to toast. You can use any light stock, it doesn’t have to be vegetable. If you don't want to use dairy products, use soy milk instead of regular milk and garnish the soup (as in the picture) with extra chopped fried mushrooms instead of cream. This recipe is not complicated, but it is made in stages. If you are under 13, you might need help from an adult (using the oven and microwave and cutting the fruit.) If you're an adult, you can get help from a child to eat it when it's finished! 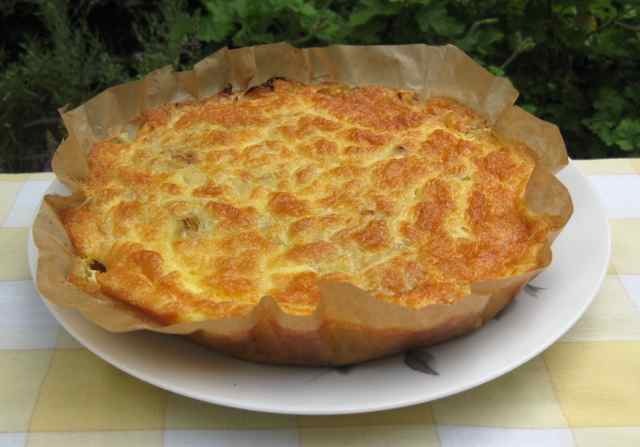 To make this tart you need four layers: first some short crust pastry (about 225g/8oz). Then for the filling, 2 large cooking apples and a few tablespoons of sugar. To go on top you can choose any ripe fruit: I used strawberries and a few apricots. Finally to make the fruit shiny (and to make it keep better) you top it all with a glaze made from 2 tablespoons of redcurrant jelly. Now here’s what you do: roll out the pastry and press it into a flan tin or pyrex dish. Press a sheet of foil over the base and up the edge (this is to stop the pastry shrinking or falling in at the sides). Bake in a hot oven (200C/400F) for about 10 - 15 minutes. Carefully take off the foil and continue cooking for another 5 - 8 minutes (this makes it crisp). Leave the flan case to cool. To make the filling, peel and core the cooking apples and cut them into small pieces. Cook them, with the sugar, in the microwave for about 5 minutes, or until they are soft enough to mash with a fork. Leave the apple mixture to cool and then spoon it into the flan case. Now, cover the stewed apple filling with halved strawberries, whole raspberries or sliced peaches. The last part of the recipe involves painting! Melt a few tablespoons of redcurrant jelly in the microwave (about 1 minute) and when it is soft, brush it over the fruit. If you don’t have the jelly you can use any red jam and strain it so there are no lumps. Now serve the tart and wait for the compliments. (It actually keeps for hours as the glaze protects the berries). Then find a baking tin and cover the bottom with a sheet of baking parchment. If you’re under 12, get someone to help you because you need to use a sharp knife. Make slits on both sides of the chicken wings with the knife. In a bowl mix the next 6 ingredients. Then paint the mixture on to the wings, making sure some goes inside the slits. You can do this with a pastry brush, or just use a spoon if you don’t have one. Arrange the wings on the baking paper and roast at the top of the oven at 200C/400F for 20 minutes. Take care when you take out the tin. Turn the chicken wings over using a spoon and fork and put them back for another 10 minutes. You may find there is a little liquid at the bottom of the tin. Pour it into a small bowl, but don’t throw it away. You can spoon it over the wings when they are cooked. After 30 minutes cooking time they will be ready. They should be slightly charred looking (this comes from the sugar which has turned to caramel). Serve them with jacket potatoes or with rice. Line a baking sheet with baking parchment (non-stick paper). With a knife, not a potato peeler, cut the peels off 3 large potatoes, taking care not to make them too thin. Put the whole potatoes in water and use them another time for boiling or chips. In a covered dish microwave the skins for 3 minutes on full power. Arrange them on the paper - but take care because they will be hot. Sprinkle over some sea salt crystals if you have them, or ordinary salt if you don’t. Roast at the top of a hot oven (200C, 400F) for about 10 minutes. Turn them over and cook the other sides for another 5 minutes. Serve with a cool dip of yogurt, creme fraiche or sour cream. If you like you can add flavour like chilli or chives. For four people you need 2 corn cobs, 4 big carrots, 4 tbsp fresh or frozen peas and some fresh mint leaves. You also need a little vegetable stock. With a sharp knife cut the kernels off the corn - reserve them for later. Peel the carrots and cut into thick slices. Then put them in a saucepan with what’s left of the corn cobs. Cover with water, bring to the boil, add a little salt and pepper and simmer for about 20 minutes. Remove the vegetables and put them on a plate. Put the corn and peas and a large sprig of mint into the broth and cook for about 4 minutes. Taste the soup and if it seems to lack flavour add some vegetable stock (see my note above). To serve: remove the wilted mint, pour the soup into small bowls and decorate with some fresh leaves. To make the carrot ‘leaves’ you need a cutter - or if you are artistic you can cut out any shapes you like from the carrot that was cooked in the soup. Ask any chef how to make French fries (or chips in the UK) and they will say they need to be fried twice: first at medium heat, then in hotter oil. Now comes a totally different view: you can fry the potatoes starting with stone cold oil. 1. Peel two large potatoes, cut into chips and pat dry with paper towels. 2. Put them in a deep saucepan (about 7" or 18cm diameter) and cover with cold oil. 3. Turn the heat to medium/high and cook for about 15 minutes. Raise the heat for another few minutes when they will be crisp and brown. Lift them out of the oil with a slotted spoon. 4. Drain on kitchen paper, sprinkle with salt and enjoy. This can be done by a child, with help. It’s far less risky than putting food into sizzling oil, but if you’re under 12 or so, you should ask an adult to be there while you are using a sharp knife for cutting the potoatoes and to help when you are lifting out the cooked chips. Asparagus is one of many vegetables that are better cooked in the microwave. Because you use so little water they take very little time and the taste and vitamins don’t disappear in cooking liquid. For two people take a bunch of asparagus (about 20 spears). Cut off the woody base. The next step is optional. You can shave off the outer part of the stems with a vegetable peeler. Wash the asparagus and lay them out in a shallow dish. Sprinkle over about 3 tablespoons of salted water and cover with a lid or clingfilm. Microwave on full power for about 6 minutes. Take care when you lift off the lid - steam can burn you. Test the thick ends (not the heads) with a knife to see if they are tender, then leave to stand for a few minutes. Serve hot or cold with plenty of melted butter or olive oil. To make vegetarian pasta, simply cook some tagliatelle or other pasta according to the instructions on the pack. Drain and serve with a generous amount of buttered asparagus and shower with grated parmesan. Or serve a wedge of nutty Emmenthal cheese on the side. Cooking beetroot (beets) in the microwave is so easy. You need 3 or 4 uncooked beetroot. Cut off the leaves and stalks. Clean the beetroot well with a brush or use a piece of cloth to remove any dirt. Cut them in half and put them in a shallow bowl with about six tablespoons of water. Cover the dish (you can use clingfilm or a plate) and cook in the microwave on full power for about 10 minutes. They are done when a knife goes in easily. Take care when you lift off the cover. Steam is very hot. When the beetroot are cool, peel off the skins. When I was a child I watched my mother and aunt making this incredibly delicious sweet spread. They made a few jars and that needed 24 egg yolks and a pound of sugar. It didn’t last long because we used to spread it on buttered matzah (unleavened bread) for breakfast, or tea, every day during the week of Passover. Don’t worry that it’s bad for you, you’re not going to eat it all at once - but I must warn you, it’s very moreish. This amount makes a smaller quantity which you could also use as a filling for sponge cake. Cut the vanilla pod in half lengthwise and split it open. Put it in a small pan with the sugar and water and bring to the boil, over low heat, stirring once or twice until the sugar has melted. Then turn up the heat, don’t stir any more and boil till it looks syrupy. It should reach what is called the ‘thread’ stage, which means that if you pour a little on to a plate it should form a thread when you lift up the spoon. Put the egg yolks into the top part of a double boiler (or into a bowl standing over a pan of simmering water). Strain the sugar syrup into the yolks and stir over heat until the mixture thickens. This will take five to ten minutes. Keep stirring and don’t go away. When it coats the back of the spoon and doesn’t simply run off it is ready. Pour the jemma into a clean jar and leave to cool. Cooking a baked apple in the oven takes at least 30 minutes, so you’d hardly want to bother for one person. Doing it in the microwave is brilliant - quick, easy and very tasty. Just remove the core from the apple using either a special gadget or a sharp knife. (Get help with this if you’re under 12). Mark a line round the circumference of the apple with the knife (this is to stop it bursting). Then fill the hole with dark brown sugar; the best is muscovado which has a treacly flavour, but demarara or molasses sugar will also do. Press it down and add another teaspoon of the sugar to put on top. Put the apple in a small bowl or container (not metal) add a few tablespoons of water and cook on full power for about 4 minutes. That’s it: the apple will be soft and fluffy inside and the sugar will have made a yummy sauce. Take care when you get it out of the microwave and leave it to cool a bit before you eat it. It’s good with cream, custard or ice cream. To cook more apples, you need to adjust the time - about 5 minutes for each one. To cook an artichoke in the microwave - first cut off the pointed tips and open it out. Wash it well under running water and turn it over to let the water drip out. Put the artichoke into a small container; sprinkle over about 3 tbsps salted water, cover with a lid or some clingfilm and put it in the microwave. Microwave ovens vary (and so does the size of the vegetable). You need to cook one on full power for about 5-6 minutes. You can test if it’s cooked like this: take it out carefully (it will be hot) and poke the end with a sharp knife. If it is soft it’s done. Take it out and cut it in half. Remove the hairy bit from the centre and serve with hot melted butter. Or leave it to cool and spoon in some mayonnaise or a mustardy vinaigrette. If you're young and have been following the 'How-to' in Lookit Cookit, here's a chance to read a recipe from someone else. Just follow carefully and it will come out like the picture. Cut the chocolate into pieces and put them in a small bowl. Melt in the microwave for about 2 minutes or until the chocolate is soft enough to stir smoothly. Mix the yolks with the first quantity of sugar (above) and whisk until the mixture is thick, pale and a lemony yellow colour. Gently fold the warm chocolate into the egg yolk and sugar mixture. Stir in the brandy, the olive oil and a pinch of salt. In a clean bowl, whisk the whites until they are frothy and then whisk in the rest of the sugar. Keep whisking until they form peaks. Fold a few tablespoons of the whipped egg whites into the chocolate, then gradually add the rest, folding carefully until there are no white lumps. Be careful not to beat too hard or you will lose the air that has been whisked into the whites. Pour the mixture into glasses and allow the mousse to set for at least 4 hours before serving. You need a small, sharp, pointed knife. Take care and if you're under 12 make sure there is an adult with you. First cut across the top in two horizontal lines. (You can just see this in the picture). This is to make the handle of the basket. Then cut in a half circular motion on each side of the handle, making sure you don't cut through it. (I’ve lifted the back section off and turned it round to show the pattern). Here it is - the finished basket. A bit of fun. Line the base and sides of an 8-inch square baking pan with baking paper or foil. Preheat the oven to 350F/175C. To make the crust: mix the melted butter with the sugar, vanilla and salt. Add the flour and mix just until incorporated. Press the dough evenly over the bottom of the pan. Bake for 25 mins or until the crust is fully baked, well browned at the edges, and golden brown in the center. To make the topping: While the crust is baking, stir together the sugar and flour in a large bowl until well mixed. Whisk in the eggs. Stir in the lemon zest and juice. When the crust is ready, turn the oven down to 300F/150C. Slide out the pan and pour the filling on to the hot crust. Bake for 20 minutes longer or until the topping barely jiggles in the center when the pan is tapped. Set on a rack to cool completely in the pan. Lift up the foil or paper liner and transfer the bars to a cutting board. Cut it into bars with a sharp knife. To make these stunning chocolate decorations all you need is a microwave, a bowl, a sheet of foil and some chocolate. In a bowl, melt 8-10 squares of milk or dark chocolate in the microwave for 1-2 minutes on full power (depending on how many pieces you put in.) Even if it still looks as if the chunks aren’t quite melted they may be ready. Just take out the bowl and stir - if it is soft enough the chocolate will be quite smooth. Put the plate in the freezer and after about half an hour, you can peel them off, pressing them up from underneath the foil. (Some of them may break, but don’t worry - you only need a few perfect ones). If you leave the sheet out the chocolate will start to soften in the heat of the room, so peel the drizzles off quickly and store them in the fridge, or in a box in the freezer. A mixing bowl, a strainer, a big spoon and a loaf tin (1lb/450g) lined with baking paper. Strain the tea into a large bowl. Put in the dried fruit and microwave it for about 2 minutes. The fruit will plump up. Now leave it to stand till it cools down and absorbs most of the tea. Add the sugar and the flour, mixing well. Then to make the mixture slightly softer, beat in an egg*. Spoon the mixture into the prepared loaf tin and cook for about 40 minutes at 180C/375F. To test if it’s done, poke a strand of raw spaghetti into the middle. If it comes out dry the loaf is cooked. Leave it to cool then slice it thickly and spread with butter. Who says baking is difficult? * Some people are allergic to eggs. You can leave out the egg and use 3 tbsp melted butter instead. You need a baking tray, some baking paper to line it with (to stop things sticking) and whatever vegetables you like (but not peas!). Cut 2 red peppers and 2 yellow peppers in half and take out the seeds. Peel a large red onion and cut it into thin slices, keeping them in ‘rounds’. Then you can choose from mushrooms, sprouts, courgettes (zucchini) or aubergines. Cut sprouts in half and slice any of the others. Now put a few tablespoons of olive oil on the paper, arrange the vegetables over the top, sprinkle on a bit more oil and season with salt and pepper. Bake in the oven 190C/380F for about 20 minutes. Turn the vegetables over to brown the other sides and carry on cooking for about 10 minutes. Meanwhile take 1 cup of bulghur. Heat a pan with a little oil and when it’s hot, put in the bulghur. Stir it around, then add 2 cups of boiling water (or vegetable or chicken stock). Shake in some salt and pepper (not too much if the stock is salty) bring it to the boil, then cover and turn off the heat. After about 10 minutes, the bulghur will have absorbed the stock and will be moist and tender. If you want to add beetroot, wash 2 - 3 beets, cut off the root part and microwave with very little water for about 10 minutes. When they are just soft (when poked with a knife), leave to cool and then peel off the skin. To put the dish together - it’ll serve 2 - 4 depending on how hungry you are - arrange the bulghur in the middle with the vegetables on the side. The picture also includes some salad leaves, roasted cashew nuts and a bit of shaved parmesan cheese. Chill two chicken breasts in the freezer for about an hour, then slice them thinly. They are less slippery and easy to cut when firm and cold. Put about three tablespoons of flour on a plate, sprinkle with salt and black pepper and dip each strip in, making sure it’s all covered. Fry some sliced mushrooms in oil in a pan till they are brown. Move them on to a plate; add a little more oil and fry the chicken strips for a few minutes on each side till they are brown. Pour on a cupful of marsala (dark, sweet, Italian wine). This will create a bubbling sauce. Put the mushrooms back into the pan, turn down the heat and cook for another few minutes. Serve with rice or noodles. If you don’t have marsala, you can use sherry. If you prefer it less sweet, use dry white wine. You need: a shallow pudding dish about 12” (30cm) long. Turn the oven on to 150C/300F. Open a pack of butter and rub a little round the dish. Put in 130g/4.5 oz pudding rice (which is different from long grain rice - it’s rounder). Then add 55g/2oz sugar and pour over 1.1 litres/2 pints milk. Mix it all together, cover the dish with some foil and put it in the oven for about an hour and a half. Take it out carefully (or get help). The rice should be creamy and soft. If you cook it for another half an hour all the milk will disappear. Things you can add: if you have a vanilla pod, cut it in half, scrape out the seeds and put it in with the milk at the beginning. This gives it an extra nice flavour. If you like it very creamy, you can add some cream at the end. You can eat the pudding warm or cold. This amount will serve about 4 people. This is a very simple dish that a child could make. All you need is two of everything. (But take care, or get help with the frying and boiling water). 2 sticks celery, 2 spring onions, 2 carrots, 2 tbsp olive oil, 2 beef stock cubes, 2 tsp tomato puree, 2 cups of water and 2 tbsp rice. Chop up the vegetables. Heat the oil in a saucepan and saute the vegetables for a couple of minutes. Add the crumbled stock cubes, 2 cups of boiling water and the tomato puree. Sprinkle in the rice, add 2 more cups of water and leave to cook over moderate heat for 20 minutes. That’s it. Done. You'll need a round ovenproof glass dish. If you're cooking the pudding in the oven, you need to butter it, otherwise you don't. Mix the cooked noodles with the sultanas. Whisk the eggs and the milk and add the vanilla sugar* or ordinary sugar if you don't have it. Pour this over the noodles, stir well and then bake at 180C/350F for about 30 minutes. Alternatively you can cook it in the microwave for about 3-4 minutes on medium. The secret is not to cook it too long. You will need to stop and stir it a couple of times, and perhaps add a little more milk if it seems to be getting dry. It is ready when the milk has turned to a thin custard. If you cook it too much the eggs might curdle and the liquid will go lumpy. But don't be put off: the microwave is the quickest way and the result is super creamy. When it cools a bit (whichever way you've cooked it) you can always add a little more milk or sugar to taste. * to make vanilla sugar, find a clean jar, fill it with sugar and put in a vanilla pod, cut lengthwise. You'll see the black seeds and these will flavour the sugar. Put on the lid and after a few hours it is ready. Use it for baking or sprinkling on sweet dishes. You need: 1.2 litres/2 pints vegetable stock (I use Osem Chicken Flavour powder dissolved in water - or you can use a cube), 25g/1oz barley (pre-treated to cook quickly), 2 leeks, washed and cut into rings, 2 medium size potatoes, peeled and cut into cubes, 100g/about 4oz cut up curly kale, washed.Salt and black pepper. It's this easy: Put the barley in a pan, cover with half the stock and simmer for about 15 minutes. Add the leeks and potatoes with a little salt and pepper (not too much as the stock can be salty) and top up with the rest of the stock. Cook for 10 minutes. Stir in the kale and cook for 5 more minutes. It's ready. Serve with some crusty brown bread. (The recipe is adapted from Waitrose Everyday Meals).